The sugar is well mixed into the liquid cocoa using our Melangeur. Both the sugar and cocoa solid particles are ground down smaller and smaller while more and more fat is released from the cocoa. 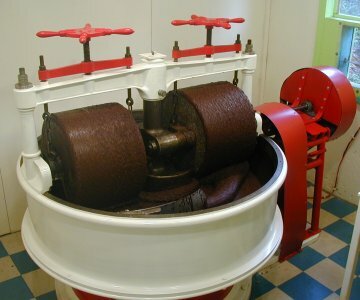 The sugar/cocoa mixture becomes smoother and remains a thick liquid known as chocolate “paste,” now ready for the refining and conching process to follow.